As the biggest cith in Thailand, Bangkok is a perfect place for vacation. So it should undoubtedly be on the list of things to do in Bangkok, especially for couples. The serene atmosphere and the well trained Thai staff alway satisfies every tourist. Its combined city view, sparkling temples, modern malls and interesting nightlife will bring all people unexpected experiences. 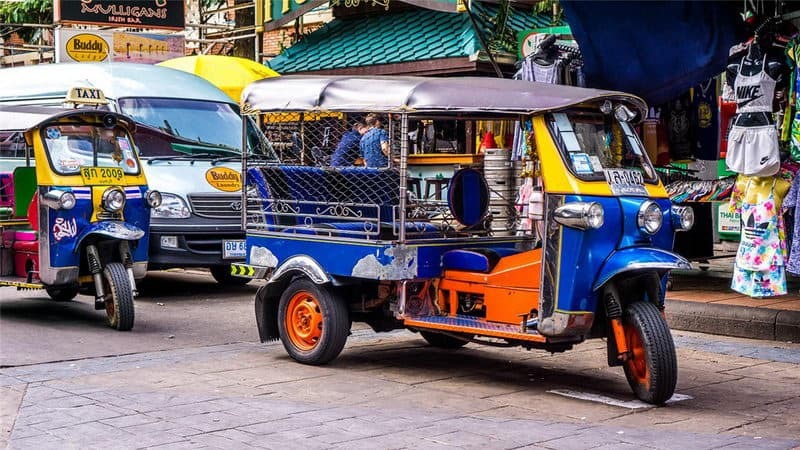 Here we list the top ten adult activities you can enjoy in Bangkok tour, so that you can experience the most fun out of your trip. Opening hours: 10:00 a.m. - 22:00p.m. Siam Paragon is the largest shopping center in Southeast Asia. It covers an area of 500 thousand square meters with a total of 250 stores so that it will spend a few days to get the whole around. It has the largest aquarium in Asia - "Siam Ocean World", which could accommodate twenty thousand people, keeps about more than 400 kinds of marine animal, including coral, gray shark, and even penguins, sharks, devil fish and majid etc.. There are also various distractions such as cinema, Spa, 52-Lane bowling alley. Walking down to the B1 of Siam Paragon, you are welcome by the delicacy street. It contains various delicacy including authentic cuisine of Thai, Chinese, and Japanese. The juice, dessert, bread shop is lined along the street. There is also various price-popular delicacy street where its spacious area can accommodate about 1500 people. Guests can set by a large aquarium while they are enjoying the delicacy, leisurely watching the fish romping in water. 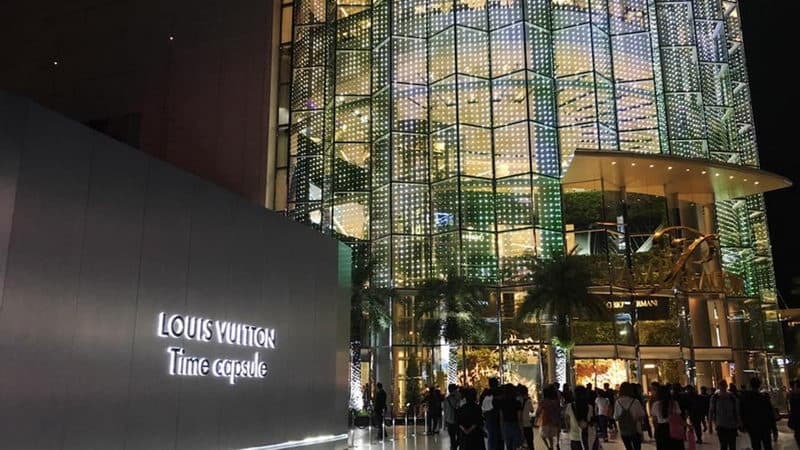 Together with Siam Center, Siam Discovery Center and MBK in its neighbor, Siam Paragon is the top choice for shopping. Thai cuisine is regarded as one of the best in the world. 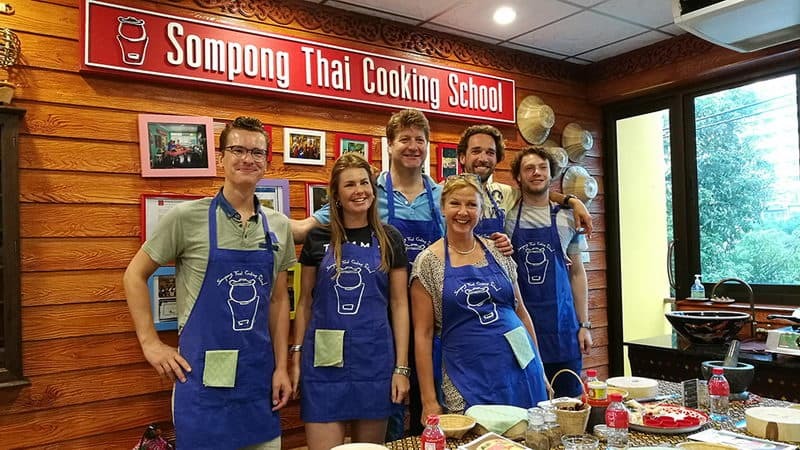 Take part in a Sompong Thai Cooking Class and spend your day emerging on an authentic Thai cooking. As part of our course instruction you will first go to a local market sightseeing to absorb an exotic local fresh fruits and vegetables. There is always an abundance of new things to see. At Sompong Original Thai Cooking School, you will use only the freshest ingredients purchased on the same day. Return to the school to take part in a warm, open and interactive cooking session during which the instructor demonstrates and explains the unique narrative of each Thai dish. Next you will get a chance to enjoy all your food that you have cooked and also take away pack if you cannot finish it. You can explore local markets after the class. Siam Niramit, a world-class celebration of Thailand's art and cultural heritage, is a must-see spectacle through which you can get an overall idea of the four dynasties of Thailand and its culture. This show is highly recommended as a start to this historical tour and a great introduction to the following visit. 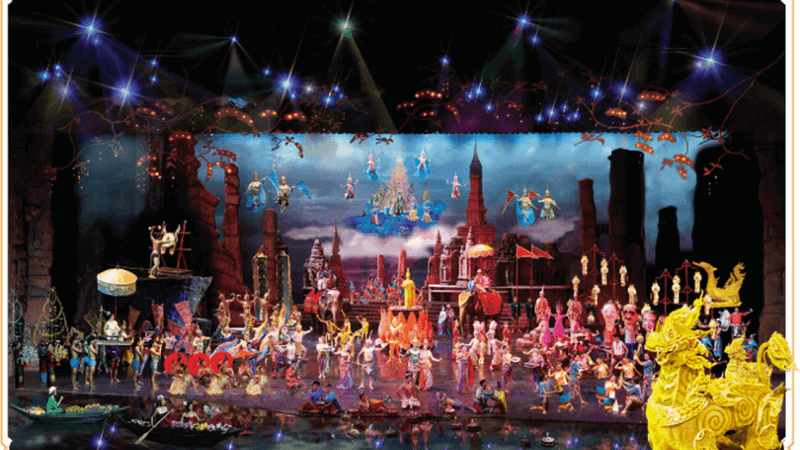 It is performed on a gigantic stage featuring over 150 performers with as many as 500 costumes. 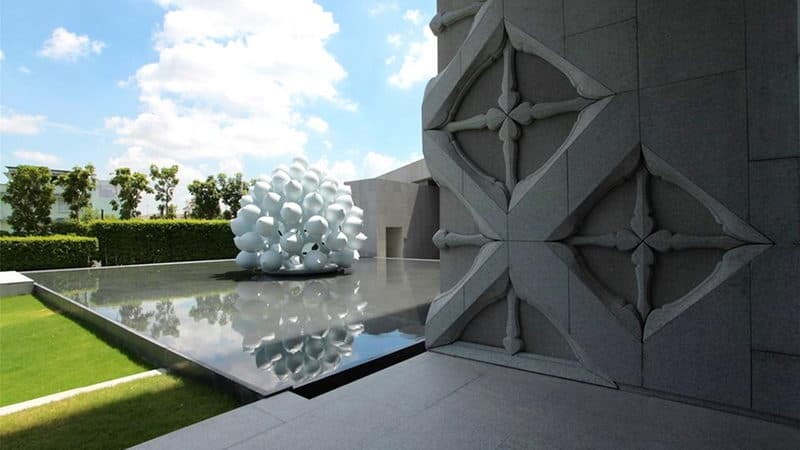 Spectacular introduction to Thailand's art and cultural heritage. Enhanced special effects using the latest technology add to the inspiring experience. You will feel like you are really in the rural village without stepping out of Bangkok. Meanwhile, the performance also presents a soul - stirring historical panorama of Thailand. Enjoy the three-act performance: Act I takes you back into the rich history of the Kingdom, Act II introduces you to the three realms central to traditional Thai beliefs and Act III takes you on a journey through Thailand's festivals. Khaosan Road located in Banglamphu which has old-style low-rise buildings and also good food. Apart from that, it is very handy to be near the Wat Po, Grand Palace, Wat Arun and Wat Saket. Khaosan Road is a very lively place for it has all the facilities tourists want and has a tourist evening market and turns into party central post 9pm. The area is also famous for inexpensive backpacker accommodation so that you will find it very easy to meet other traveler wandering around from around the world and share your travel experience together. At the daytime, Khao San Road is relatively quiet, after 11 a.m. stores will continue to open; but at night it is the heaven of nightlife with various bars, street snacks, massage for your chice. 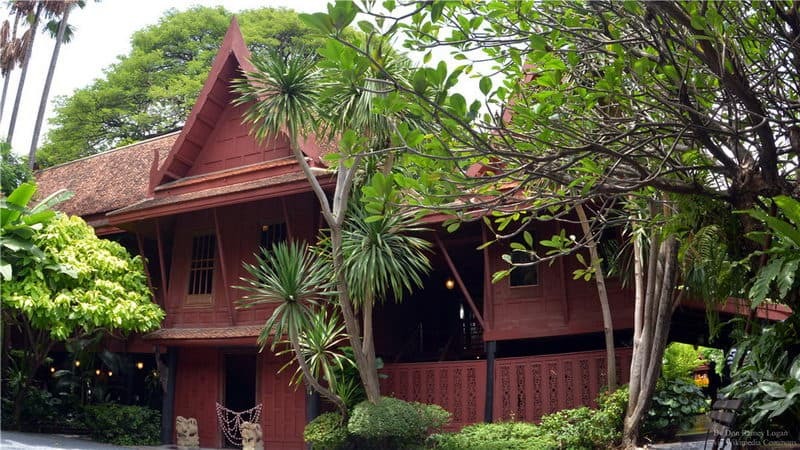 Jim Thompson was originally an American architect. After World War II, he succeeded in open the Western silk markets and revitalized the Thailand silk industry. The whole building is a typical Thai Garden, built in 1959; it consists of 7 buildings suspended in a small canal. This is the most famous Thai silk store and it is also a museum for various high level Thai silk. In addition, it also exhibits his collection, including great works, decorations, porcelain and so on from Thailand and even the whole Asia. You need a day to visit the Safari World, starting from 9:30 in the morning until 5 in the afternoon to return; and you will have no boring time because there are always performances and activities in the park. 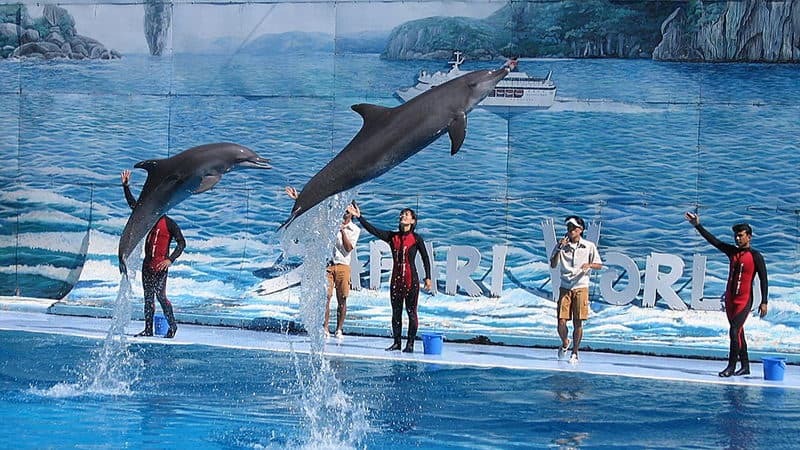 It is divided into Safari Park and Marine Park, advise to follow the morning activities show forward, boxing show, sea lion Show, elephant show, dolphin show, bird show, a delight day will soon pass. Must see: 1, elephant show (pay 200 rupees and you can take pictures with elephants); 2, seal performance; 3, drive through the Tiger Park, do not forget to take pictures with the little tiger. This is the most memorable thing. If you love modern art, Museum of Contemporary Art is a place you cannot pass up. Combining with the European modernism and post colonialism, its works convey unique views to Thailand nationalism and modernity. It is a stunning visual feast. There are not too many tourists, very quiet and comfortable, each layer exhibits different works of local artists. Wonderful painting expresses the real Thailand's history and Thai characters. All kinds of characters, animal, the absurdity of odd-shape sculpture, contemporary art painting cannot be more suit for a relaxing attraction. The only drawback is that the location is a bit secluded, located in the middle of the airport and downtown and the traffic is not so convenient. Entrance fee accounts 250 baht per person. Opening hours: 18:00 - 23:00 every Monday, Wednesday, Thursday and Sunday. 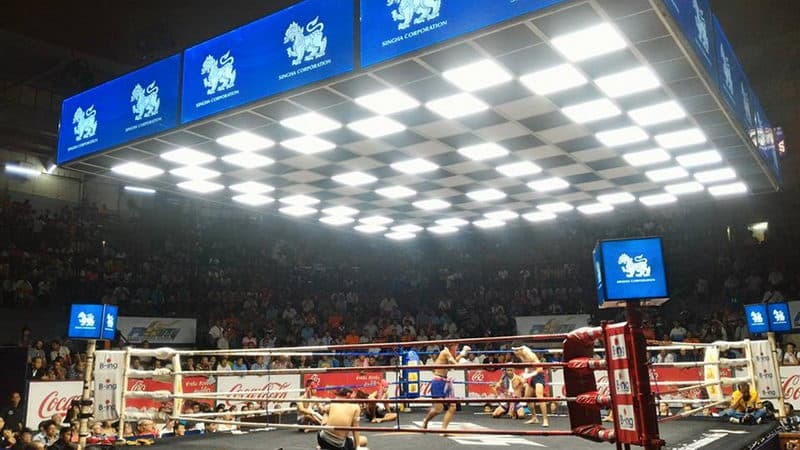 Rajadamnern Thai Boxing Stadium was founded in 1945 and is decorated like an old cinema. It costs only a few minutes walking from the Khao San Road. Non-holiday game usually starts at 6:00 in the evening, ends at 11:00 at night, 9 matches a day and each about 30 minutes. But on Saturday, game starts from the early afternoon. The fare is 1000,1500 and 2000 baht, but it is recommended for the first time to buy the 2000 seats, very cost-effective! The position is just beside the stage, so close to see the players' small action and punches sound, and can also have photos with players. While on second-class seat, you will be able to stand or sit on the concrete bleachers and have a better view of the whole matches. 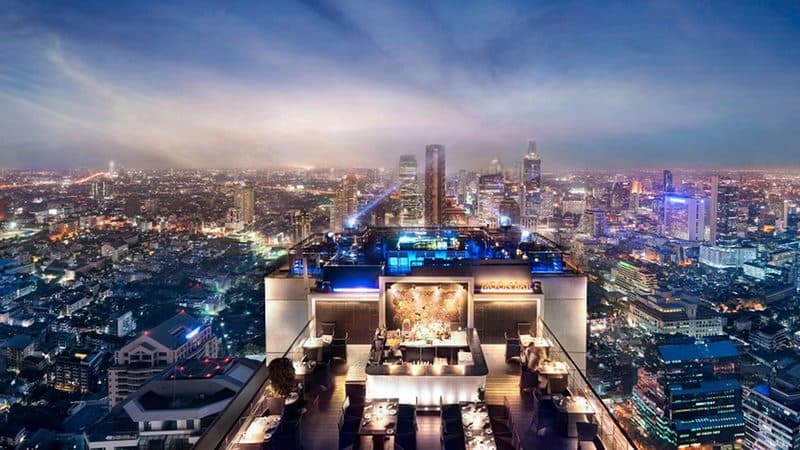 If you want to go to the best rooftop bar in Bangkok, then here is your first choice! Here is a wonderful place to watch the Bangkok sunset and take sip of night drinking. The city scenery is amazing! Through its open board, you can see the whole Bangkok city night scene, including the Bangkok newly built tallest skyscraper – the MahaNakhon which is designed by famous German architect Ole Scheeren. The Moon Bar Bangkok is at sixty-first floor, and there are about 50 seats, but make sure you get there before 6 p.m., otherwise you will have no seat. The shortcoming is that after the evening is could be very crowded and the price of beverage is very high. 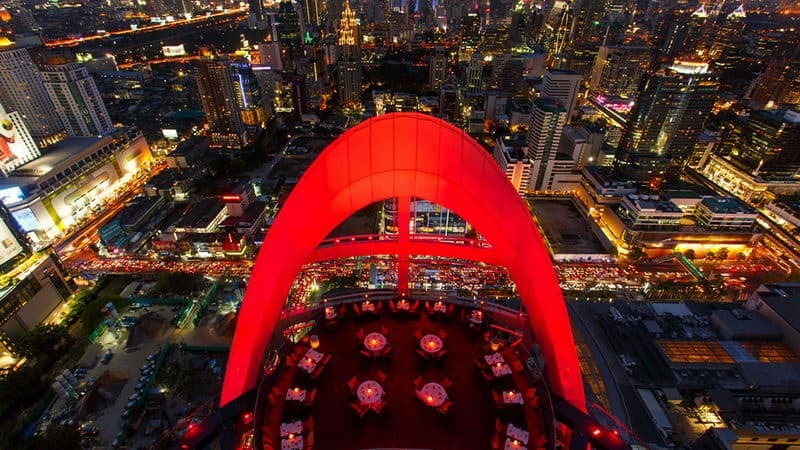 Red Sky Bar locates at the 55 layer of Centara Grand Hotel, just behind Central World shopping mall and the traffic is very convenience. The Sky Bar has two layers, indoor and outdoor, but on sunny days, most people choose the outdoors. Outdoor performance area is backed by a large halo and the big circle will keep changing the color. There are also live blue or jazz performance and the singer sings very well. The second layer is also open, the location is more private with a laying bed or a separate table. It is toward the Bangkok night scenery so that suitable for quiet chat with people and whispers between couple. Taking a sip of soft wine in bar, it is a luxury experience sitting in 55 layer below the heavy traffic noise of the city of sunlight while in the 55 layer, the air is comparatively a faint quiet, full of contradictions and beauty. Every 5-7 p.m. there have happy hour buy 1 get free 1, but available only check out before 7 p.m.. Happy Hour is the best time for you can watch the sunset and the night view at a time! If you can't decide where to go or how to plan, don't hesitate to contact our experts. We will help you maximize your travel experience and provide you with the best travel time and places you want to see. Here are some sample tours. They can be customized to meet your interests. For more ideas from our Best Thailand Tour 2018/2019.